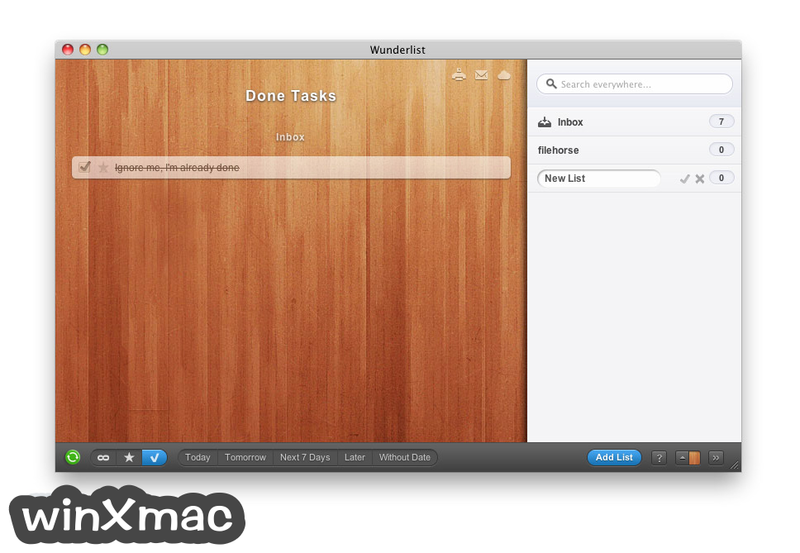 Wunderlist for Mac 是完成任務的最簡單的方法。無論您是計劃假期，與合作夥伴共享購物清單還是管理多個工作項目，Wunderlist 都可以幫助您解決所有個人和專業問題. 無論您是經營自己的企業，計劃在海外冒險或與親人分享購物清單，Wunderlist 是在這裡幫助你完成任務。您甚至可以離線工作，Wunderlist 將在您重新上線時同步您的數據。您可以使用 Wunderlist for Mac 作為我們的桌面應用程序之一，或將其下載到您的智能手機。使用本地應用程序為每個平台獲得更好的體驗。無論你需要做什麼，只需添加一個新的列表，並開始填寫任務。通過添加到期日期跟踪所有的事情。我們對每個雄心勃勃的捷徑國王都有一顆心。你想要快車道？只需按 Ctrl + N 創建一個新的任務，或按 Ctrl + F 搜索，或按 Ctrl + L 獲取新的列表. Wunderlist 可在 iPhone，iPad，Mac，Android，Windows，Kindle Fire 和 Web 上免費使用，可在所有主要設備上無縫地工作，讓您的生活保持同步. 注意：需要 Wunderlist 帳戶和 64 位處理器. - Have you tried our Global Quick Add? Hit Ctrl+Option(Alt)+W and you'll find a quick and easy way to add and search for to-dos. In this update, we've fixed a crash on our Global Quick Add that meant that some to-dos weren't saving. It should all be working just as it should now. - New: Download the update, hit CTRL+Option+W and behold the beauty of our new Quick Add and Search feature. It’s not just a pretty face though, behind that sleek exterior lives a very powerful mind. - Click on the ‘+’ and you can quickly add a new to-do with Smart Due Dates*, such as ‘Tweet about how pretty the new Wunderlist update is today at 5pm’, a due date and reminder will automatically be added to your to-do without you having to move away from your keyboard. Now toggle across to the magnifying glass where you’ll find a mighty go-to and search function that lets you quickly go to one of your lists or a particular to-do. - The best bit? You don’t even need the app to be your focus view for this to work. As you work through a document you can quickly add to-dos without getting distracted. - New: You won’t just find our Smart Due Dates* in Quick Add though. Every time you want to add a to-do in the app you will be able to type in when it’s due and Wunderlist will set the due date and reminder for you. - Improved: Do you have a million lists and can never find any of your to-dos? Well, we’ve improved our Search just for you. It’s now a lot faster and more accurate. On top of that, it will save your common search terms and you can choose whether you want to filter out your completed to-dos or not - just click on the dropdown next to the magnifying glass in the app’s search bar. - Fixed: We’ve cleaned out a few gremlins in the system including the one where our app crashed when you tried to open a file from the Quick Look screen. - *Smart Due Dates are only available for English, German, Japanese and Chinese. More languages to come soon! - Fixed: Here at Wunderlist we like to help. We like to help a lot. But perhaps this time we went too far. Our Wunderlist Helper has been working at 110%. We’ve dialed it back so that you’ll no longer experience high CPU and network data usage. - Fixed: Did we say we like to help? It’s true, but perhaps we don’t need to remind you twice that you should be doing your chores. The issue with duplicate reminders should now be fixed. - This is the update you’ve been waiting for because Folders is here! So click 'More' to learn... more. - If you’re a list-lover and sometimes find your Sidebar resembling an episode of Hoarders, you can now organize them into Folders by clicking and dragging one list onto another. Boom! Your Sidebar is now magically cleaner and super organized. - And finally, we’re super happy to report back that the annoying language switching bug that many of you were reporting has been apprehended by the authorities and won’t be making a ruckus anymore. - Capture your ideas, thoughts and reminders in an instant. No matter which app you’re using, when an idea strikes just type ⌥⇧W to use the brand new Quick Add widget. It lets you instantly add an Item to your Inbox along with a Reminder and Star. - We have improved the overall stability of the app and squeezed some of the most commonly reported bugs. - Say hello to the Today widget. Whenever you need to know what’s on your agenda, simply open the Notification Center’s Today view, and you’ll find all your to-dos due today. - If you’re browsing the web with Safari — or other apps like Maps — and come across something you want to keep or view later, just click on the share icon and Add to Wunderlist button to save it. 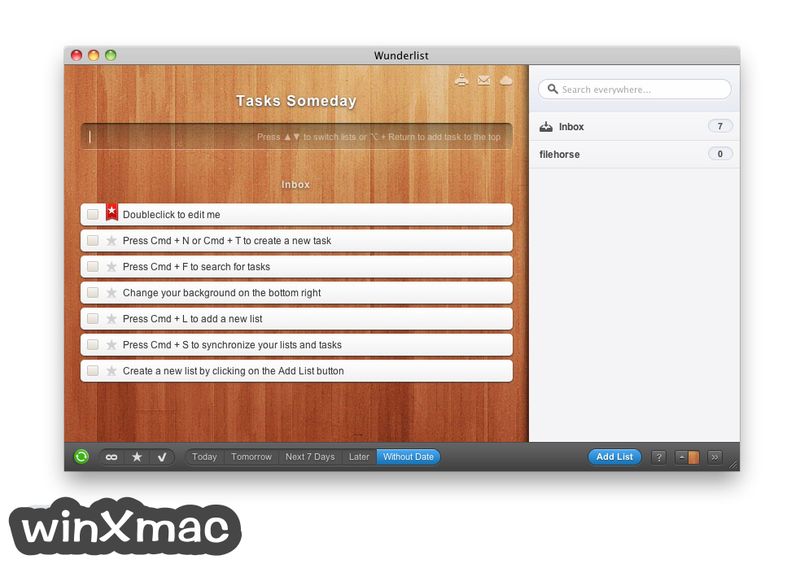 - To perfectly match Yosemite’s redesigned interface we’ve refined every detail of Wunderlist for Mac’s design so your lists look stunningly beautiful. Plus, we’ve also optimized the code behind the app so everything feels incredibly smooth. - Wunderlist now fully supports Handoff. If you’re working on a list on your Mac, you can now pick up exactly where you left off on your iPhone or iPad when you head to a meeting. - We’ve also fixed a whole swathe of creepy-crawly bugs and made more stability improvements for you. - To all out emoticon-fans out there, we made some big improvements to their appearance across the app. - Full support for Albanian, SLovakian and Romanian language added. - Some of you reported a bug where due dates weren’t always saved when creating new Items or where the date picker didn’t always match up. Thanks for the bug reports, because these are now fixed! - All starred Items are now added to the top of you lists if you’ve got it set in the app preferences. 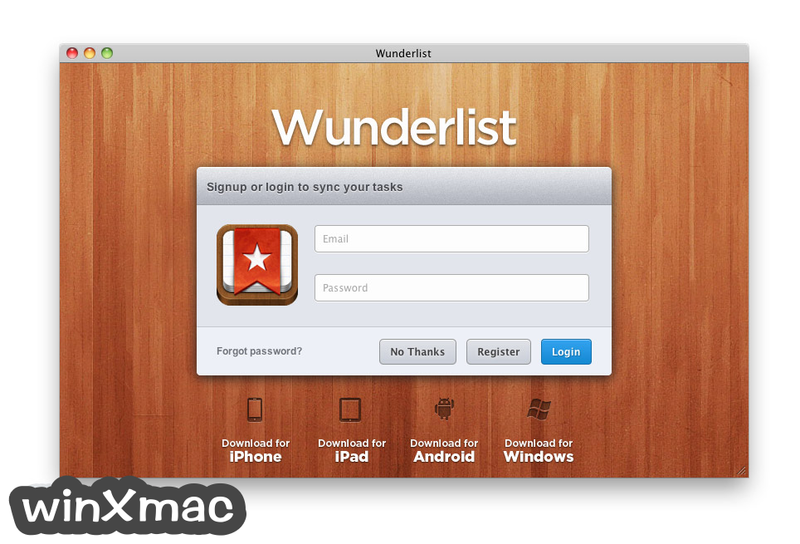 - Unfortunately there was a bug that denied purchasing Wunderlist PRO. If you by any chance bought the In-App purchase but didn't get PRO, please contact support. Sorry for this inconvenience, this issue is fixed now. - We fixed a bug that would prevent users from becoming PRO after a successful purchase, sorry for that. - We fixed several bugs, making the app use less CPU and battery power. - We fixed the Facebook login functionality. - Comments have arrived for Wunderlist Pro - A simple and easy way to communicate with all your teammates about your to-dos! - Wunderlist Pro Trial - Everyone now has limited access to Files, Assigning and Comments, so give it a try today! - Every member of a shared list can now invite teammates to help collaborate.